Perceptive Gazette readers will recall our recent traumatic bicycle wheel failure, which necessitated the replacement of both wheels on our recumbent tandem (the rear wheel failed, but we also replaced the front one out of an abundance of caution as well as to make sure the two matched). I'm happy to report that after a delay of more than a month, we're back on the road sporting new wheels, spokes, freewheel hub, and cassette, and everything looks mahvelous. However - and there's always a however, isn't there? - I overlooked the fact that the new wheels and spokes meant that I would also have to recalibrate our computers. We have a Planet Bike wireless computer on the front and a wired model on the back, and both rely on a small magnet (see photo at right) mounted on a spoke to generate a signal transmitted to the computer that allows it to measure distance and speed. Each revolution of the wheel moves the magnet past a pickup mounted on the fork, and when calibrated to the wheel's circumference, the time it takes for each revolution is the key component of the speed and distance algorithms. With me so far? Obviously, when the bike mechanic replaced the spokes, he had to remount the magnet. But since he had only the wheels and not the whole bike, there was no way for him to know exactly where to place the magnet. So, when I returned home with the new wheels, I had to put the magnet back in the right place, so that the transmitting unit would generate a signal. That was pretty easy for the back wheel, but I ran into a puzzling problem on the front. No matter how I placed the magnet on the wheel, I couldn't make the transmitter send a signal to the main unit. I even replaced the battery in the transmitter, to no avail. It was as if the magnet was no longer strong enough to generate the signal (and I say that as if I understand exactly how the thing works, which I don't). I knew all along that I was stretching the limits of the wireless unit to their max; the computer was designed for a "regular" bicycle, not a long-wheelbase recumbent, and the distance from the main unit to the transmitter was now - for whatever reason - just a tad too far. As a last resort, I contemplated just buying a wired computer, but then I wondered whether the magnet strength had any bearing on the strength of the transmission. Yes, that's right: we're gonna need a bigger...magnet. And I knew just where to find one. I happened to have two magnets from an old hard drive laying around my workbench. [What? Doesn't everyone disassemble their old hard drives and harvest the magnets?] If you've ever toyed with one of those neodymium magnets you know that the size-to-strength ratio is incredible. 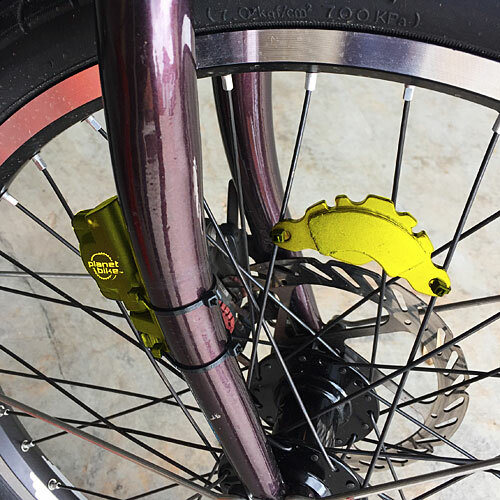 If the bike computer transmitter simply needed a stronger magnet, the hard drive component would likely provide a transmission of length of, say, from here to the moon. I tested my theory by removing the transmitter from the fork, and waving the hard drive magnet over it while standing a couple of feet from the main unit. Sure enough, the unit immediately displayed speed. All I had to do was figure out how to mount the magnet on the spokes, reattach the transmitter to the fork, and get the two aligned. That actually proved to be a pretty simple task (and if you've followed my DIY projects, you know how truly amazing that statement is). The magnet's mounting holes were exactly in the right place to affix it to two spokes using thin zip ties. 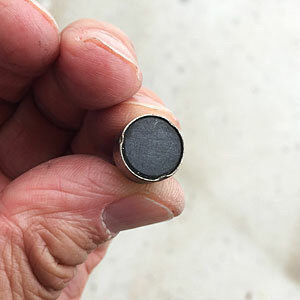 In addition, the strength of the magnet meant that the transmitter's alignment didn't have to be as precise as in the past, so that was easily accomplished. Here's what the final installation looks like (I've highlighted the magnet and transmitter in yellow to make them easier to discern). Now, if this was a race bike, this would be a really stupid thing to do. The new magnet is quite heavy, and the last place you want to add weight on a bicycle is the wheel. But this wheel by itself already weighs almost as much as some entire bikes - only a slight exaggeration - so the additional rolling weight is just not an issue. The only thing I worry about now is whether we'll be picking up stray pieces of metal from the side of the road as we cycle along...you know, things like old car wheels, anvils, or lengths of discarded rebar. The morals of this story are twofold. One, there's always a solution if you can get creative enough. And (b), always tear up your old hard drives and save the spare parts. In the interest of full disclosure, I admit that I haven't actually tested this setup to see if the accuracy of the computer has been affected. After our next ride, I'll compare the distance reading to that of the rear computer (and probably also to my Map My Ride phone app) to see if this really was a workable solution. This page contains a single entry by Eric published on June 2, 2016 3:59 PM. Unintended Consequences: The Exciting Sequel was the previous entry in this blog. Captured by The Highwaymen is the next entry in this blog.